From left to right: Gary daigle, terry donohoo, marty haugen, rory cooney, Fr. michael joncas, and david haas - all OYH podcast alumni! In this episode, we host our own little composers forum! Matt and Zack speak with Gary Daigle - composer, musician, and producer - about his work with The Dameans. They discuss collaborative song writing, the importance of a broad harmonic vocabulary, and how intentional invitation can change your life. As a bonus, you'll hear from a bevy of previous podcast guests including Rory Cooney, Kate Cuddy, Fr. Fran O'Brien, Tony Alonso, and Marty Haugen. It's a liturgical composers family reunion, and you get a front row seat! So, please open your hymnal to "You Have Anointed Me." For more information about Gary Daigle and his other compositions, visit his composer page at GIA Publications. You can purchase a copy of the score and a copy of the song recording from GIA Publications. Here you can also purchase the other song recordings you heard in the episode: "Peace is Flowing" (arr. and performed by Steve Petrunak), "Path of Life" and "Remember Your Love" (The Dameans), "Ubi Caritas" (Fr. Fran O'Brien), "On That Day" (Kate Cuddy), "This is My Song" (arr. and performed by Michael Mahler and Tony Alonso), and "Where Your Treasure Is" (Marty Haugen). The recording of "One Bread, One Body" (Fr. John Foley, SJ) can be purchased from OCP. The cover of "You Have Anointed Me" by Brenda Folz can be purchased on iTunes. You can see photos and videos from the 20th annual Liturgical Composers Forum by visiting our Facebook page. You can learn more about the One Call Institute by visiting www.onecallinstitute.org. The blog post that Matt mentions can be found here. Don't forget to "subscribe" so you'll never miss an episode! All content of this podcast is property of Open Your Hymnal or its content suppliers and is protected by United States and international copyright laws. For information about the podcast and its use, please contact us. "What You Have Done for Me"
Tony Alonso is one of the most prominent voices in contemporary liturgical music. 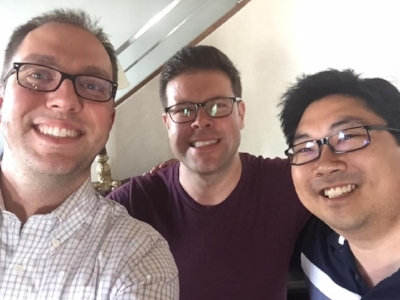 In this conversation, Matt Reichert and Zack Stachowski discuss with him the beginnings of his career, how he has developed his own compositional voice, the lessons he's learned, and the critical role of mentorship. So, please open your hymnal to "What You Have Done for Me." For more information about Tony Alonso and his other compositions, visit his composer pages at GIA Publications and World Library Publications. You can also visit his website: www.tonyalonso.com. You can purchase a copy of the score and a copy of the song recording from GIA Publications. Here you can also purchase the other Tony Alonso songs you heard in this episode: "Come to the Table," "In the Arms of God," "Litany of Mary," and "A House of Prayer." You can purchase a copy of the instrumental piano recording of "What You have Done for Me" (arranged and performed by Paul Tate) from GIA Publications. You can find out more about the work of Music Ministry Alive! by visiting the program website.